Posted September 16th, 2017 by nocopf-admin & filed under News, Youth. 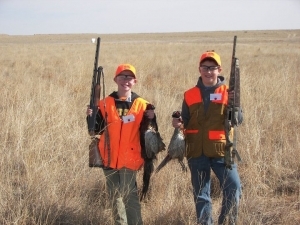 Northern Colorado Pheasants Forever invite youth ages 8-15 to join us October 20-22 for a weekend of outdoor adventure on Colorado’s Eastern plains! Activities include horseback riding, ATV riding, clay shooting, archery, a climbing wall, a live pheasant hunt, and more! All meals and boarding are provided. All youth must be accompanied by a guardian ($75/guardian). Costs include all meals and lodging from Friday dinner through Sunday lunch. We have room for 40 people in dormitories. Camping is available for $10/night and includes electrical hook-up. The $200 registration fee helps pay for food, dorm, cost of fuel for ATV, feed for horses, ammo, clays, etc. Sunday’s Nebraska pheasant hunt requires an additional fee of $45 to pay for required youth licenses and habitat stamps. Please note, this is a youth only hunting weekend in Nebraska. You will need a sleeping bag and pillow, good hunting or hiking shoes for pheasant hunt, proper clothing for the weather, and towel and wash cloth.